Okay, let me be honest. I had absolutely no idea how to auspiciously begin a blog, especially one about wine, travel and food. Stumped, I spent the last few weeks trying to prepare, and wow, has it been awesome. I’ve eaten out at some amazing restaurants, enjoyed some very special wines and taken as many pictures as possible without embarrassing my companions. So lets start with the Michelins. In the past few weeks, I’ve been lucky enough to eat at The French Laundry, Cyrus, Manresa, La Toque, Gary Danko, and Bouchon. In this blog I’m just going to talk about the French Laundry, I’ll get into the other individual restaurant experiences later. Suffice it to say the meals have all been truly exceptional. At each restaurant unforgettable food and wine coupled with top notch service (with one exception). And my editor will kill me if I don’t mention that in most cases the restaurants have top notch tasting menu prices. Clearly Thomas Keller’s French Laundry deserves its stellar reputation and the three Michelin stars it has earned, which is why I’m starting with it. But for now back to the French Laundry. First it was nearly impossible to get a reservation. The restaurant takes reservations two months in advance — so you need to call two months to the day you want to eat. I started phoning in October. It was embarrassing. I would call and it would take me hours — two to two and a half— to even get through and then the best I could do was get on the waiting list. Finally I lucked out in that the restaurant was closed for two weeks in January. On the day they re-opened they had a stack of available reservations. It still took more than 100 phone calls and two and a half hours but I got through. I ended up with a Saturday reservation at 5:30 p.m. I was ecstatic. Note: There is an easier way to get a reservation (a much easier way) but I’ll get to that later. The restaurant is elegant yet approachable. We were seated in an alcove off the main dining room that has a beautiful stone wall. There were only three tables in the area, which made it feel very cozy and warm. We were offered two nine-course tasting menus: A Tasting of Vegetables, which didn’t interest us but I must confess it is pretty amazing, and the Chef’s Tasting Menu. Just in case, I’ve typed the Chef’s Tasting Menu of the day at the bottom of this post but for now the menus are posted by The Thomas Keller Restaurant Group here. Obviously, the food was exceptional. I won’t bore anyone by describing how I felt about each little bite and every extraordinary flavor. I started with the “Sabayon” of Pearl Tapioca with Island Creek Oysters and White Sturgeon Caviar. It was so smooth and luxurious on the tongue those wonderful meaty oysters, the tang of chives with the final snap of salty caviar. Check out Thomas Keller and chef Cat Cora talking about it on YouTube and it makes me want to enjoy the taste all over again. I know it sounds simple but the “salad of French Laundry garden heirloom beets” was a delight. The vegetables are grown across the street in the restaurant garden. What set the dish apart was the bright lemon vinaigrette that was cascading across the plate. Every dish was delightful and at the end of the evening we were sent away with a bag that included shortbread, pretzel bread — just because we hadn’t had any with our meal and our waiter really likes it — and the mignardises, which we couldn’t fit in our stomachs. Now let me dismiss a concern I’d been hearing around Napa. In talking about our upcoming visit, I’d heard some complaints that the French Laundry doesn’t do wine pairings and instead pushes bottles and half bottles on customers. I definitely felt like the staff took the time to ensure we had an unforgettable night. When I asked questions about how certain dishes were prepared they told me. I’m not sure I’ll ever be able to duplicate the dry aged duck, which is hung in the refrigerator for seven days, but I’ll definitely try. In addition to being funny and nice, our waiter offered us a tour of the kitchen after our meal. And one of the staff members, who shares my Italian last name, came over to introduce himself. It felt very personal and judging from the web, our experience has been duplicated thousands of times. OK, back to the kitchen tour. It is a pretty amazing little place. When I was growing up my mom had a catering company and from what I saw this kitchen was half of the size of that but the level of organization surpassed the catering kitchen and any other kitchen I’ve ever seen in every way. It was a really rewarding experience to watch the workings of a kitchen staff, who appeared completely calm and unruffled by a restaurant packed with people. A humorous aside is that inside the entrance to the kitchen there is a large screen TV showing images of Keller’s New York wonder Per Se. Apparently Keller likes to see his restaurants in action. The chefs at Per Se watch the French Laundry at work on a similar screen in their kitchen. 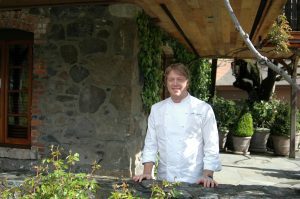 Chef de Cuisine Timothy Hollingsworth stands outside of the French Laundry. One of the other bonuses of accompanying our waiter to the kitchen is that he mentioned the best way to get a reservation at the French Laundry. Be Tom Hanks. Just kidding, he did say that they try to accommodate notables but more importantly he said one of the easiest ways for the average person to get a reservation is to use American Express’s concierge service. I’ll try that trick next time. Please let there be a next time. What do you remember about the first funeral you ever attended? Chances are, it was an emotional time for you.